I have a lot of trouble connecting the photo to the diagram. What am I actually seeing in the photo? There are dark blobs at the top and bottom. A diamond shape of dark lines. A concentric circle (or rounded diamond) inside the outer diamond. An X formed from two intersecting rows of 7ish mostly horizontal short lines or blobs. Which of these features correspond to what parts of the DNA molecule? ...have a lot of trouble connecting the photo to the diagram. 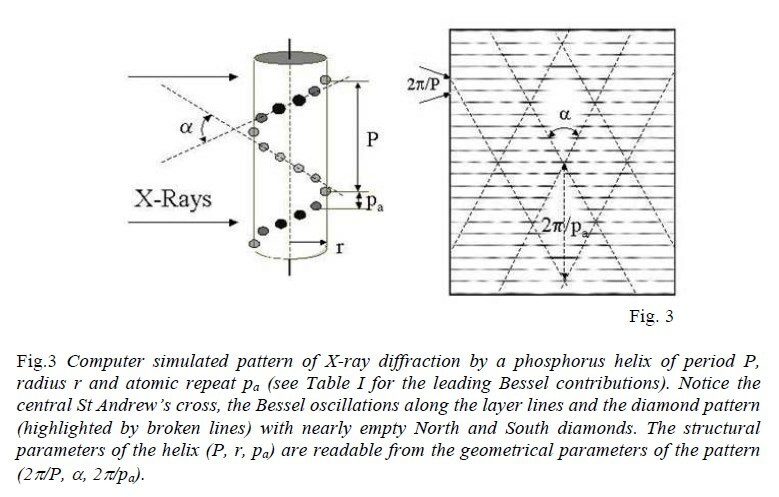 And that's quite excusable: interpreting that X-ray image is actually very complicated . All the quotes and images in this answer, except the bulleted list further down, come from this paper (Lucas, 2008), which explains that historic picture in details. 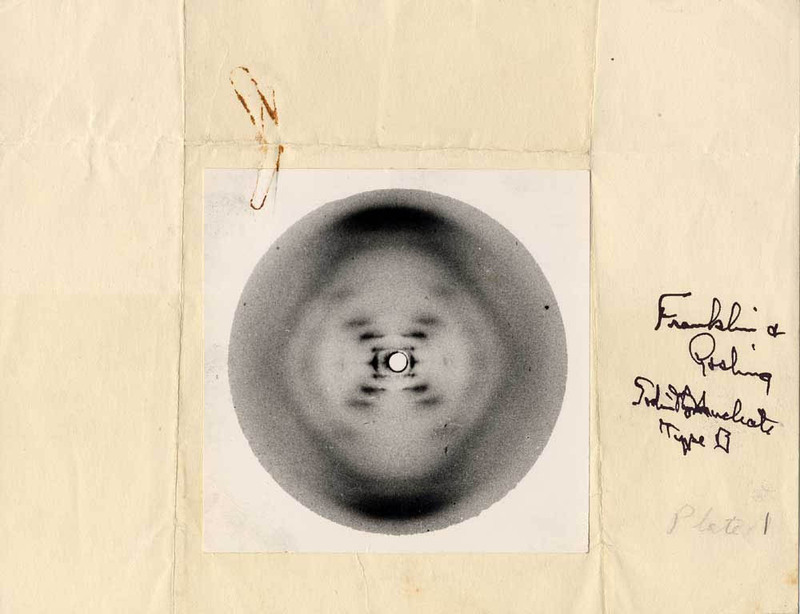 In 1952, Cochran, Crick and Vand developed an analytical theory for X-ray diffraction by a monoatomic helix. 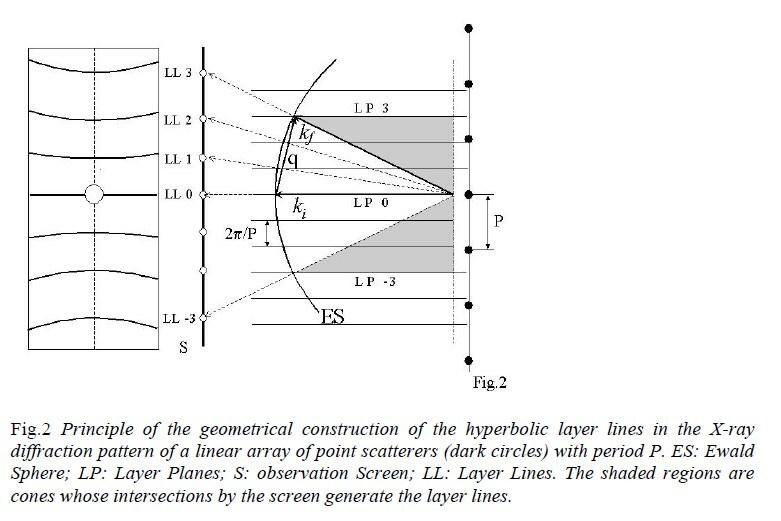 The immediate interest of their theory was to give a transparent, analytical expression of these amplitudes at a time, in 1952, when computers, if at all available, were barely capable of a brute force calculation of the total diffraction intensity. In this image, a X-ray diffraction image of A-DNA (left) and the more common B-DNA (right) show a periodic pattern in the layer lines. The layer line separation reveals the value of the polymer repeat period. The decrease of over 20% of the layer line spacing when going from A to B implies an increase of that much in the period: P = 2.8 nm for A-DNA and 3.4 nm for B-DNA. 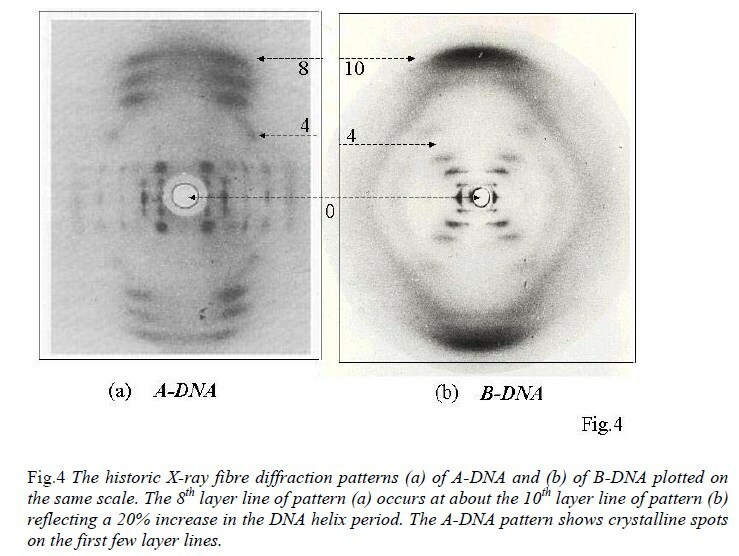 Look at the sharp, discrete spots observed near the center of the diffraction pattern for A-DNA along the first few layer lines, these suggest the crystalline order in the fibre. In the high-humidity B-DNA pattern, these crystalline spots are absent, suggesting that the extra water molecules must have invaded the space between the DNA molecules, freeing them from being locked into crystallites. The thick arcs at the top and bottom of the B-DNA pattern are found at approximately 10 layer line intervals from the center, implying that B-DNA had 10 repeating units within one period of 3.4 nm. These are produced by the scattering of X-rays by the equidistant, nearly horizontal flat bases separated by 0.34 nm. 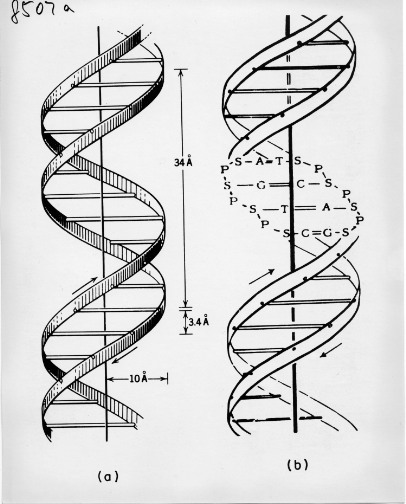 The A-DNA pattern lacks these big smears, suggesting that the bases in A-DNA are not horizontal, and the number of base pairs per helical period is closer to 11. The central cross in B-DNA represents the Saint Andrew cross expected from a helical molecule. The large radius r (1 nm, indicated by the meridian angle of the cross) and the absence of intensity in the meridian diamonds indicates that the phosphate backbone is at the periphery of the helix. This cross appears to be absent in A-DNA, however, this is due to destructive interference from some of the inclined base pairs. Lucas, A. (2008). 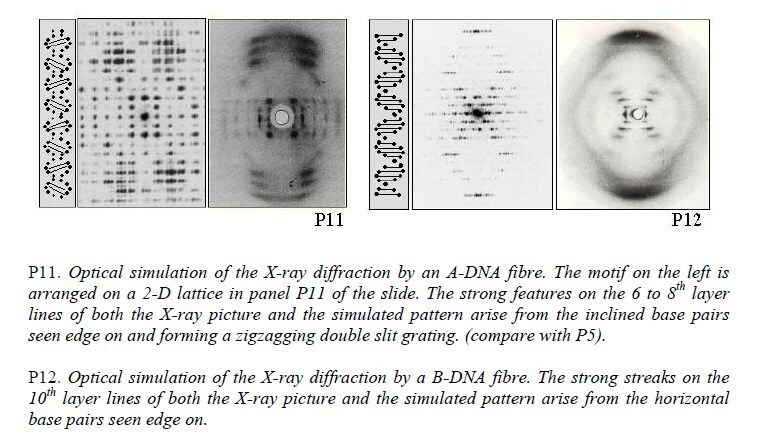 A-DNA and B-DNA: Comparing Their Historical X-ray Fiber Diffraction Images. Journal of Chemical Education, 85(5), p.737. Not the answer you're looking for? Browse other questions tagged dna history imaging or ask your own question.